Corsair SSD Toolbox provides everything you need to manage your Corsair SSD including TRIM, secure erase and drive cloning. The main screen at launch shows the drive information of single drives attached to the system. Other drives will appear in the drive information window, but the core functionality is restricted to authorized Corsair SSDs. RAID volumes will not be seen as single drives as the tool cannot address them individually. You can do firmware updates, SMART monitoring, send TRIM commands, secure erase your drive and more. Most importantly for new owners, you can clone your drive to get your new Crucial SSD up and running. If you have invested in a Corsair SSD recently, then there is a good chance that you want to make sure that you can enjoy it for the many years to come. Corsair SSD Toolbox is a lightweight piece of software designed to help you clean, secure delete data and optimize your volume to maintain its peak performance. Following a fast and forthright setup, you are welcomed by a rather rugged and outdated interface. Then again, since the GUI is designed as a dashboard, you are unlikely to encounter any issues while navigating and accessing the desired function. 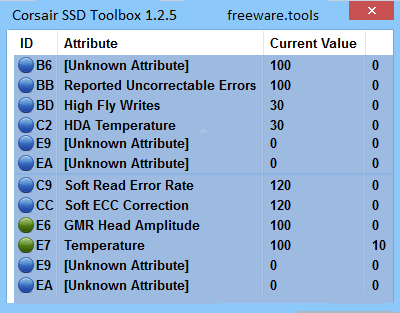 As you probably expected, the tool displays general information about the selected drive, including but not limited to the model number, serial number, firmware version, drive size, ATA version, temperature, total host reads and writes as well as the supported features. Moreover, the app enables you to find out about the new releases and make sure your SSD runs using the latest firmware. In addition to providing you with general information, the utility packs several other notable features, such as SMART status, disc clone, secure wipe, optimize and over-provision. The latter has the role of helping you allocate an ideal size of space on the volume for the SSD controller, a practice that can contribute to maintaining the performance and longevity of the drive. The optimizing tool employs a TRIM command to identify and report data blocks that are no longer in use, such as the those left by deleted files, for instance. On the other hand, it is worth mentioning that the TRIM function along with the secure wipe solely works with Corsair SSDs. All in all, Corsair SSD Toolbox can be a useful application for anyone who has a solid state drive from Corsair and that wants to make the most out of the volume.